Summer blockbusters, popcorn, and a reprieve from the hot weather. All things that conjure up pleasant memories of summer at the movies for many, I’m sure. What about adding library programming and awesome librarian superstars to the movie-going experience? This summer San Francisco Public Library (SFPL) has teamed up with a local movie theater, the Alamo Drafthouse at the New Mission, to partner on their Kids Camp. Kids Camp runs from May to August at the theater and is a way for kids and their families to affordably see films together with low ticket prices at just $1 – $5, with all proceeds going to local non-profits. 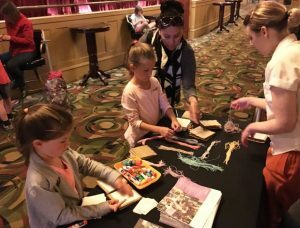 On Wednesdays the films are free so SFPL staff has been facilitating pre-show crafts weekly in the lobby. Library staff also get to introduce the film and talk up Summer Stride and get some time in the spotlight! Did I mentioned that the majority of the films in Kids Camp are based on books? 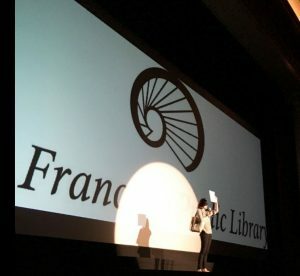 The theater actually reached out to SFPL gave staff the opportunity choose the films that are screening. Classics like The Princess Bride, The Neverending Story, Coraline, Where the Wild Things are, Charlotte’s Web, and Fantastic Mr. Fox are on the big screen again thanks for a truly collaborative process. For the public, it’s been an awesome opportunity to see the Library, do something fun before their movie, and sign up for our summer learning program, Summer Stride. I have been pleasantly surprised to find out how many people have already heard about our Summer Stride program, which was really gratifying. Adults mentioned the bus ads they had seen or kids mentioned they had gotten information about it at school. Our publicity is working! For one staff member, Maricela Leon-Barrera, Early Learning Coordinator, doing outreach at the theater brought her joy. She expressed, “What an exciting opportunity for families to bring their children in a lovely revamped theater that has come back to life and that they get to do it for free!” The New Mission Theater is a historical cinema that had been closed for 22 years. Through its reopening and enthusiastic approach to partnerships, it has started to cement itself as an open and welcoming community partner. 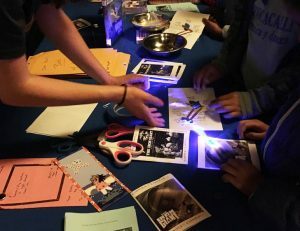 What new or outside-of-the-box community partners have you been able to connect with this summer for your library? Cristina Mitra is the Family Engagement Coordinator at San Francisco Public Library where she coordinates school-age STEM and cultural programs for children and their families. She is the Chair of the School-age Programs and Services Committee. Her favorite thing about summer is sun, splashing, and soft serve.